Saturday night on the closing weekend of the 2017 Noir City Film Festival was another great evening, a double bill of THE MAN WHO CHEATED HIMSELF (1950) paired with IRON MAN (1951). I'd never before heard of THE MAN WHO CHEATED HIMSELF, let alone seen it, and it was one of my favorite discoveries at this year's festival. It had a fun, fast-paced 81-minute story and terrific San Francisco locations. 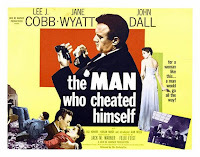 THE MAN WHO CHEATED HIMSELF is the story of police Lt. Ed Cullen (Lee J. Cobb) who has just welcomed his brother Andy (John Dall) to his precinct, where they'll be working together as detectives. 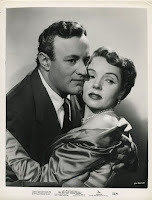 Wealthy Lois Frazer (Jane Wyatt) is going to divorce her hubby (Harlan Warde) and discovers he's recently purchased a gun. She suspects her husband plans to kill her and immediately calls Ed, with whom she's having an affair. Ed comes over and shortly afterwards hubby does indeed break into the house with nefarious plans in mind, but rather than having Ed arrest him, Lois uses her husband's gun to kill him. Ed makes the fateful decision to help Lois avoid any nasty questions and dumps the body in the bay. Since he's investigating the case, this shouldn't be much of a problem. But then kid brother Andy repeatedly demonstrates he's a good detective, putting together piece after piece regarding who dumped the body -- which inexplicably, yet more and more certainly, lead to...his brother?! I quite enjoyed the unusual plot, with one brother inching closer and closer to realizing the big brother he idolizes is mixed up in the case. The movie builds to a visually striking, memorable climax filmed at the empty Fort Point at San Francisco's Presidio. There are terrific shots of Cobb and Wyatt running down empty hallways; Wyatt's scarf caught by the wind and floating oh so slowly to the ground, potentially giving away their hiding place, is a wonderful moment. It's interesting to see Cobb in a lead role, as a man who almost seems to know in advance this woman is going to be the end of his career, but he's OK with that. His determination to pursue the relationship despite the red flags and his stoic acceptance of his fate made me think of Robert Mitchum's line in OUT OF THE PAST (1947), "Baby, I don't care." Wyatt is not someone viewers would expect to see cast as a femme fatale, but she sells it, playing a well-off woman who is always looking out for No. 1. She seems to get a thrill from her "beauty and the beast" type romance with the gruff cop, and as the cover-up unfolds she alternates whining with demonstrating calculating nerves of steel. It's a lot of fun to see such a well-known "perfect TV series mom" in this type of role. Dall, who starred in GUN CRAZY (1950) the same year, is winning as the young newlywed cop whose life is about to get way more complicated than he ever imagined. He fiancee turned wife is played by Lisa Howard, who was married to the film's director and later became a journalist. 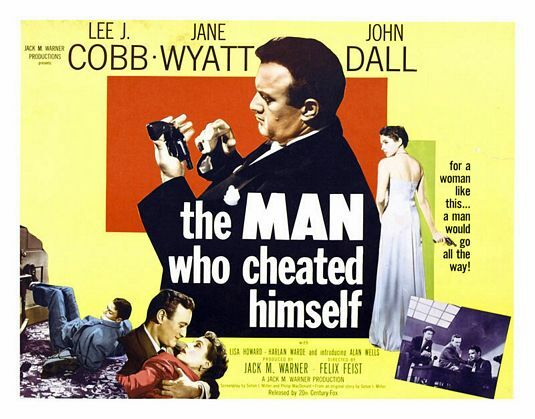 THE MAN WHO CHEATED HIMSELF was directed by Felix E. Feist. It was filmed in black and white by Russell Harlan. 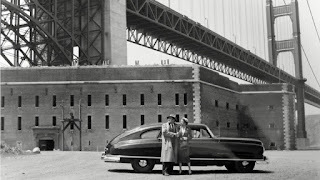 August 2017 Update: It was a thrill to visit the film's Fort Point location! Here are some photos. May 2018 Update: I had the chance to see this film again -- this time in a brand-new, restored print! -- at the Arthur Lyons Film Noir Festival. September 2018 Update: My review of the Flicker Alley/Film Noir Foundation release of UCLA's restored print may be found here. I think this is in the public domain. I remember watching it and being so surprised to see Jane Wyatt play against type. And she was good! I hadn't heard of this prior to coming across it on YouTube. Loved the cast, the setting (great pics) and the story. I kept hearing Baloo the Bear: "Stay away from them. They ain't nothin' but trouble." LOL re Baloo! So glad to know you each enjoyed it. I hope more people will enjoy it thanks to either TCM or the upcoming release from Flicker Alley. The restored Film Noir Foundation print they're putting out should look much better than YouTube!